ALLEGRA BOVERMAN/Staff photo. Gloucester Daily Times. 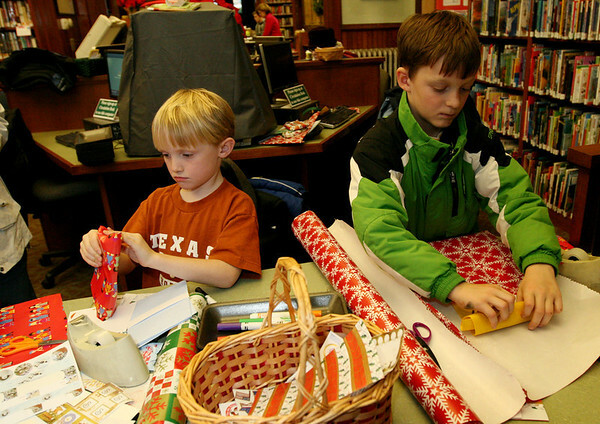 Manchester: From left, Declan Kirk, 7, and Connor Cunningham, 8, wrap gifts they made during the Manchester Public Library's annual Gift Making and Wrapping workshop held on Thursday afternoon. There were more than 30 children busy making a variety of gifts - from dressed-up dolls and calendars to beaded jewelry and picture frames and more. Then they could wrap them.